Russia's decision to cut gas exports to Ukraine is causing dismay across Europe, where supplies in a number of countries have been disrupted. The US has also expressed concern, saying the move raised "serious questions about the use of energy to exert political pressure". Exports to the EU and Ukraine are carried through the same pipes. Russia says Kiev is stealing the EU's gas. State-run firm Gazprom cut supplies on Sunday in a dispute over prices. Russia said it had no choice but to act after Ukraine refused to sign a new deal accepting an immediate increase in gas prices from $50 to $230 per 1,000 cubic metres. The average EU charge is $240. 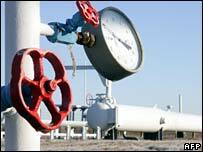 Russia supplies 30% of Ukraine's gas, and about 25% of Western Europe's needs. Hungary, Poland and Austria have reported a fall in supplies. EU Energy Commissioner Andris Piebalgs said the crisis was causing concern. Germany - no problems yet, but later cuts to big firms "not ruled out"
Gazprom says it is piping enough gas via Ukraine to meet its commitments to other countries. Ukraine says it is not using a single cubic metre of Russian gas, and that the loss of Russian supplies will not hit ordinary Ukrainian consumers during the harsh winter. However, it has warned that supplies to industry could be affected. Ukraine insists that it is being punished for its attempts to become more independent from Moscow and develop stronger ties with the West, after the Orange Revolution and the election of Western-leaning President Viktor Yushchenko. Other countries which remain in Russia's sphere of influence continue to receive gas at below-market prices. US state department spokesman Sean McCormack expressed regret over Russia's decision, and said the abrupt steps would create "insecurity in the energy sector". Earlier, Ukraine's own state-run gas firm blamed Russia for jeopardising Western European supplies. "Gas is not flowing at all through some transit routes, which can lead to a fall in pressure in all the pipelines and limit the overall supply of gas to Ukraine and Europe," said Eduard Zaniuk, a spokesman for Ukrainian state-run gas giant Naftogaz. "Naftogaz declares such actions unacceptable because they endanger gas deliveries to Europe." Ukraine has said it has the right to take 15% of the remaining supplies in the pipelines as payment for transporting the gas to Western Europe. In Hungary, gas firm MOL said its supplies from Russia were already down 25%. Hungary's economy ministry is advising large consumers to switch to alternative energy sources like oil wherever possible. Germany's largest gas supplier warned that the disruption could cause problems if the dispute dragged on. Poland and Austria have also reported diminished supplies. EU governments are convening a meeting of their gas industry experts in Brussels on 4 January to discuss the crisis.